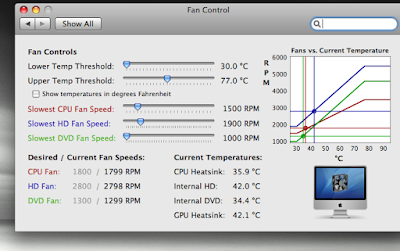 If you're an Apple fan then chances are you need fan control. This app lets you regulate the speed of your cooling fans thus allowing you to regulate the temp of your imac,macbook or powerbook. No two environments are the same so depending on where you are, you might need a bit more speed to cool off your computer. You can get this for free over at Download.com. Apple needs to go ahead and include this with every new mac pre installed especially the laptops. Once you download and install it,you access it by going to system preferences and its listed under other. I have mine set to around 1500 rpm but you can set it to whatever you desire and hw much noise you are willing to put up with for your mac to stay "cool". I included a screenshot below.